The crankshaft…The most important component in the engine? Arguable, but the most inaccessible should it fail & the one which will potentially take out the highest number of other irreplaceable parts at the same time. Assuming you have a sound crank rod & pin for your engine it would be foolish not to ensure it gets as much oil as possible from the somewhat meagre supply available from the standard pump. 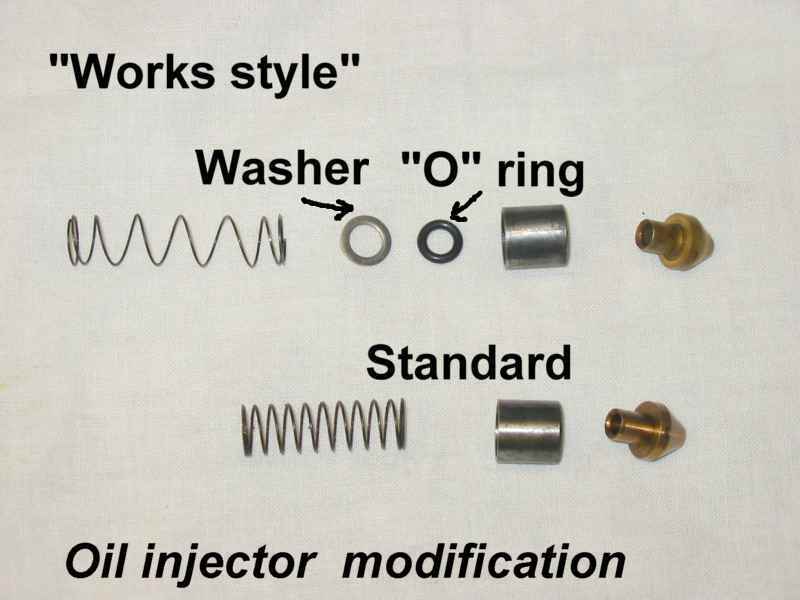 The standard oil injector assembly comprises a light compression spring, a steel sleeve & the oil injector cone. The spring seems to vary from engine to engine. Its only function seems to be to hold the injector to the end of the crank. When the engine starts oil pressure alone will keep the cone in place. Some even argue that the crank’s rotation produces a degree of suction through centrifugal action – wishful thinking, “imagineering” or fact? I don’t know. I do know that the flow of oil, driven by whatever forces, pushes the steel cup towards the crank end. The cup is a fairly good fit in the timing cover oil-feed borehole – the one sealed by the large chromed bolt – and we can assume that, if in good condition, little oil will escape around the periphery of this item. Note !!! I have seen this cup “hang up” on the threaded section of the oil feed gallery where burrs have been raised – maybe an over tightened/cross-threaded sealing bolt at some time in the bikes history or just a poorly cut OE thread. If it gets stuck in this way – No oil supply to the crank !!! So assuming we have a free moving spring & sleeve with oil flowing towards the crank at full pressure. The oil “sees” the oil feed injector cone with its small central drilling. This drilling is there to restrict flow to the crank & in doing so force oil to flow up the timing cover delivery tubing to the timing gear spindles, cam spindle & rocker gear. It is worth mentioning at this point that the oil injector cone has a different sized central drilling for the two types of crank in use on these engines. I have seen a cone with a 3mm drilling in use on roller bearing cranks & a 4mm holed cone for the bushed big-ends used on some 175 engines. The bushed cranks are not favoured for hard use (given the low output pumps we are stuck with) & NOS bushed rods & pins are very hard to find. For these reasons bushed cranks are often replaced by roller units – it is essential to use the smaller holed cone when this happens or the rest of the engine will be starved of oil. Conversely, a bushed crank must always have the larger holed feed cone. Back to the plot…. The oil now has two possible routes; to the crank or up the timing cover….well no …it has a third choice. To squirt out between the top of the steel sleeve & the back of the oil injector cone! Unlikely? Maybe, but the Moto Parilla race shop went to the trouble of sealing off this possible route by a simple modification to the standard oil delivery components. I am indebted to Richard Morley – our GP Rider correspondent – for remembering that this simple mod was done to his race engines by the Parilla race mechanics back in 1964. Small mods like this are employed by race teams the world over – often as a result of bitter experience – so we would be very foolish to ignore their hard-won expertise. As can be seen from the picture on this page an O-ring & small washer are all that is required. The O-ring should around the parallel section of the injector cone after it has been passed though the steel sleeve. The OD should be such that it clears the ID of the steel sleeve. Before the spring is fitted a steel washer is fitted over the parallel section – a loose fit on both OD & ID. Usual disclaimers – no guarantees of 10mph more top speed, 1000 more revs or anything at all for that matter. Maybe a bit more oil making its way up to the hard-pressed cam & rocker gear?